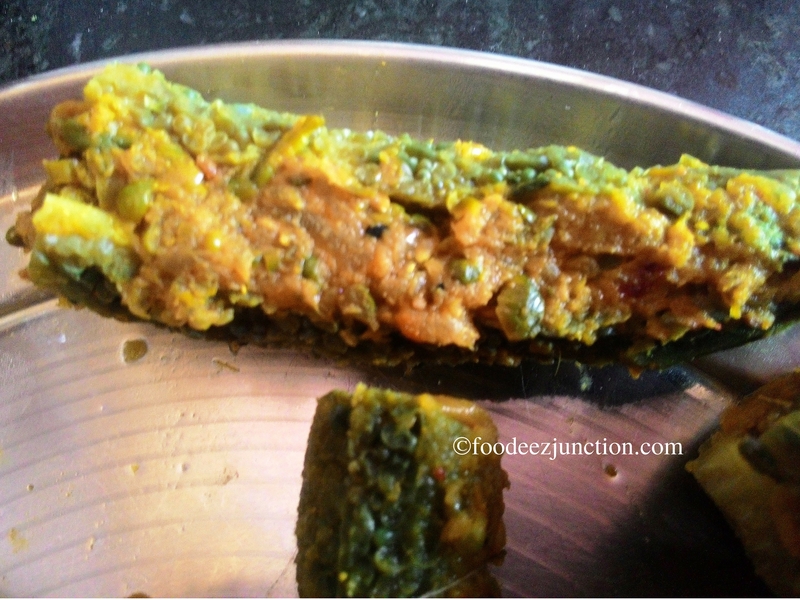 Bharwan Karela Recipe or Karakaya Recipe is easy to make and will be liked by you, even if you don’t like this veggie. This Bharwan Karela recipe or stuffed Karela recipe is for vegetarians; non-vegetarians will like it too 🙂 . As I had told in my previous Meetha Karela Recipe that this bitter vegetable comes along with many medicinal and health benefits. You can check it here, if you have missed it. Karela is known by several names, some of them include Karakaya, bittergourd and bitter melon. During my hostel days in Delhi, mess walahs introduced this stuffed Karela to me. I used to skip the mess food but this cuisine, bharwan karela, made me and my roommate to go and munch it. I, recently, bought Karela from the grocery store to try various vegetarian recipes of this particular bitter melon. Though I don’t like it much, Karela is good for health. If you are concerned for your health, which you should be, and is interested in weight loss, go ahead and try the various Karela recipes. The main ingredients constitute Karela or karakaya, onion, salt and various spice powders. Salt plays an important role in toning down the bitter taste of Karela. 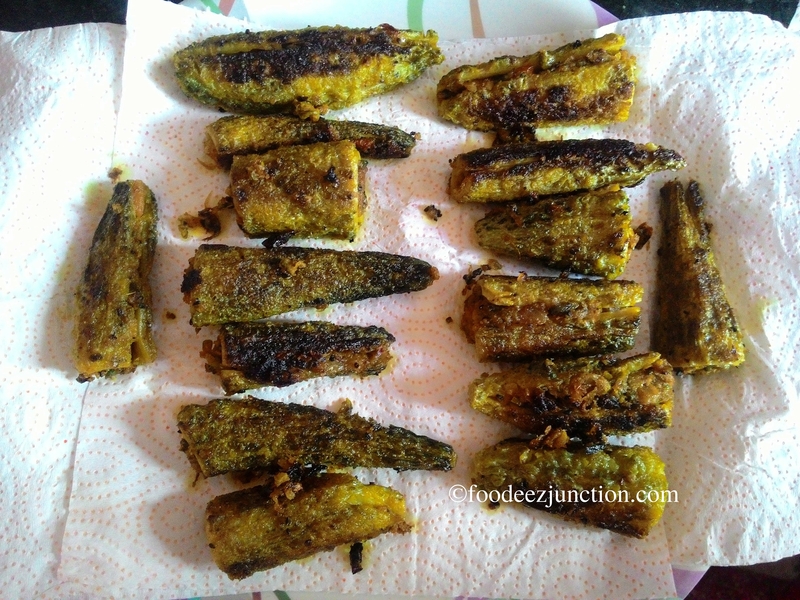 Here is the recipe for Bharwan Karela or stuffed Karela. Wash Karelas/bitter melons nicely and then roughly scrape them. Save the peeled skin of karelas in a bowl. Wash the scraped karelas again. Slit one side of each karela with knife, be careful! Remove the pulp. If the bittergourds are bigger length-wise, you can cut them in 2 or 3 equal pieces, like I had done. Add 1 tbsp salt to the bowl of peeled skin karelas. Mix it well with the help of your hand and keep it aside for 10-15 minutes. After marination for 10-15 minutes, wash it properly in running water for at least a minute. Spread the bitter melons or karela in a plate. 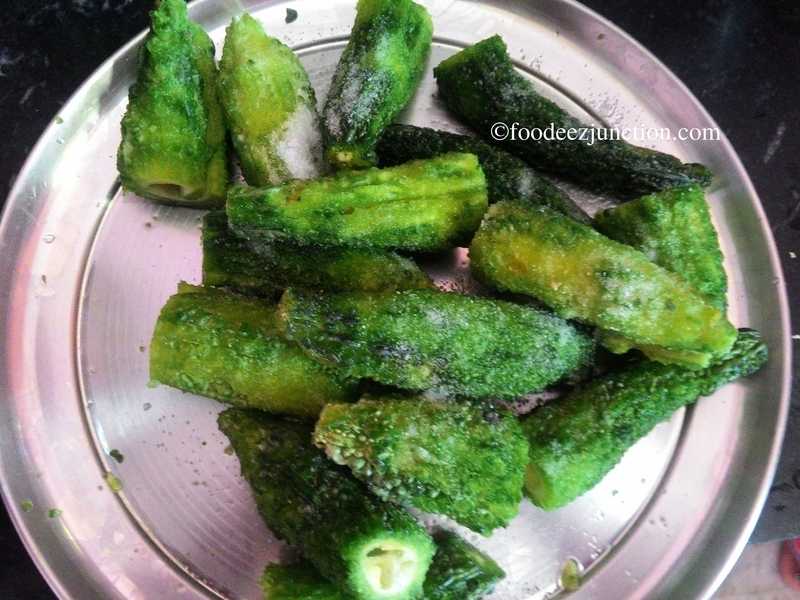 Add 2 tbsp salt or you can rub the salt on each karela with your hands. Squeeze 1 lemon on the karelas now. Mix well with your hands. Keep it aside for 15 minutes. After 10-11 minutes of marination, take a wide-mouthed pan, fill it with water and boil it. After 15 minutes of marination, put the karelas in the boiling water for 5 minutes. Now taken them out of boiling water and wash them in running water for a minute or two. 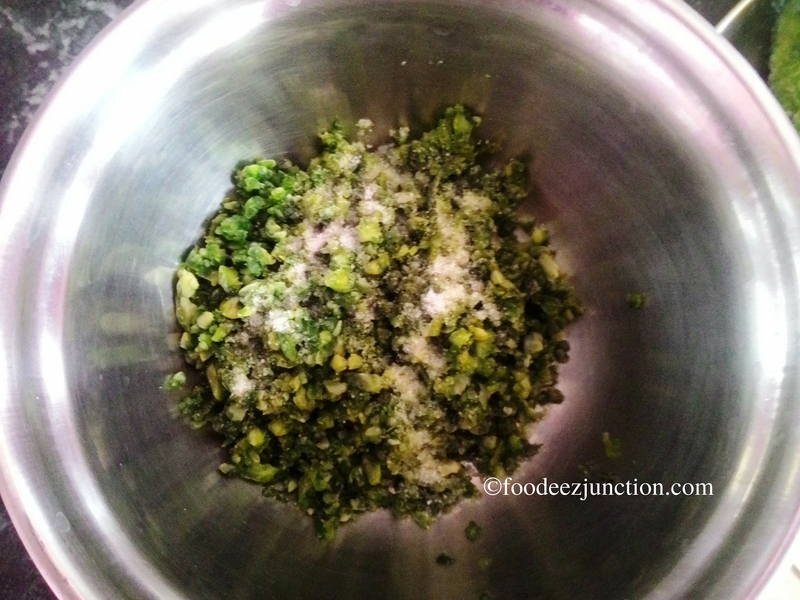 Let’s make the stuffing for Bharwan Karela. In a pan, heat 3 tbsp refined oil. Add cumin seeds, kalonji and saunf. Saute and after 10 seconds, add the chopped onions. Saute the onions till they turn tender. Add ginger garlic paste and saute for 40 seconds more. Now add all the spice powders – dhaniya powder, haldi powder, garam masala, amchur powder, finely chopped green chillies and kashmiri mirch powder. Saute for 30 seconds and add the peeled skin of Karelas (which we had already marinated and washed) and finely chopped tomato. Stir fry the masala for 8-10 minutes. Keep stirring. Once done, take the masala in a bowl and let it cool down. 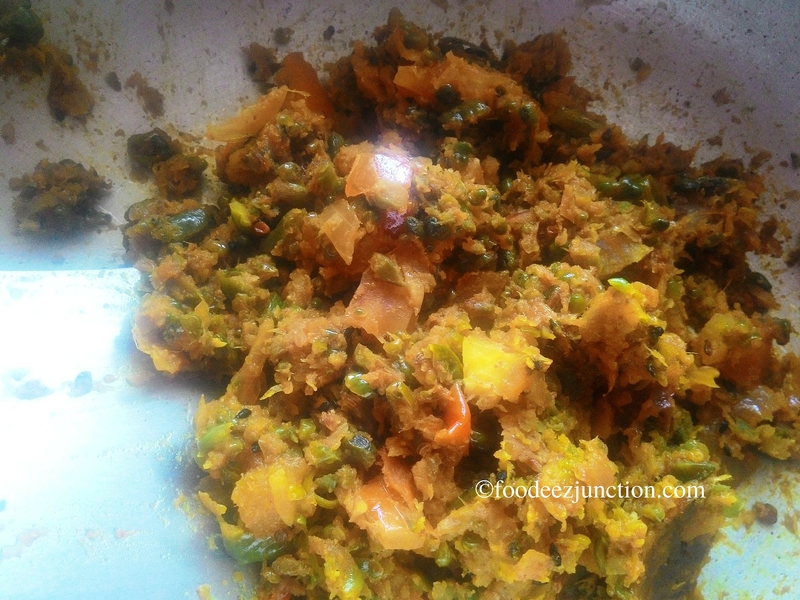 The stuffing for Bharwan Karela is ready. Now, slightly, with a light hand, start stuffing each karela. Once all the karelas are stuffed, tie each of them with thread as shown in the pics below. Now, shallow fry them in a wide-mouthed pan. Don’t overcrowd the pan with karelas. After every 4 minutes turn the sides of karelas, so that they get cooked evenly. They will turn light greenish brown from each side. Bharwan Karela is ready to be served! 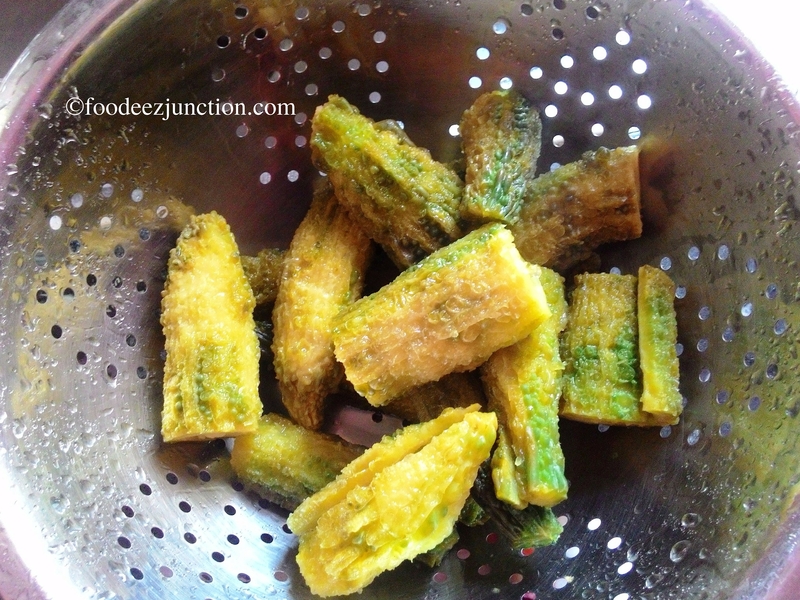 Cut the threads from each karela before serving. Serve them hot; have the stuffed karela with parathas or rotis and dal. 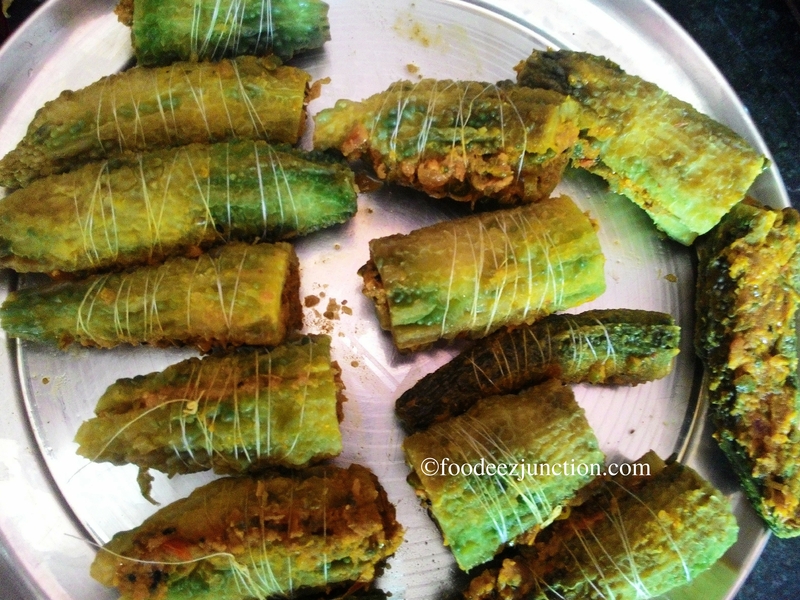 You can store this stuffed karela in refrigerator for 3 days. Enjoy! Hope you liked this step-by-step Bharwan Karela Recipe; do let me know when you make it. Tip: Remove the pulp of bittergourd with the help of peeler and remove it before cutting the Karelas into halves or three pieces.